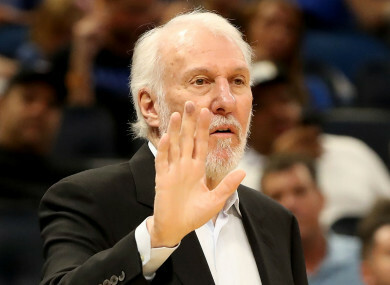 Gregg Popovich tore into his team’s “pathetic performance” and claimed the Phoenix Suns “got robbed” after the Spurs won 126-124 on Tuesday. Rudy Gay’s buzzer-beater secured a victory that moved the Spurs to 30-22, yet Popovich was furious with his team’s effort. Popovich addressed the media after the game and offered a frank assessment. “We were really fortunate to win the game,” the Spurs head coach said. “I thought that they outplayed us, out-coached us, ‘out-physicaled’ us, out-executed us. “We had no respect for them or for the game. We didn’t play with each other. Popovich then walked off without taking any questions. Email “Phoenix got robbed: Popovich tears into his Spurs after 'pathetic performance'”. Feedback on “Phoenix got robbed: Popovich tears into his Spurs after 'pathetic performance'”.